Elan Valley Trail from Rhayader at Elan Valley01597 810880workWalking RouteThe Elan Valley Trail is a linear path following the line of the old Birmingham Corporation Railway. The trail starts in Cwmdauddwr, just west of Rhayader and finishes 13 km (8 miles) further up the Elan Valley at Craig Goch Dam. The trail is virtually flat and has self-closing gates, picnic sites and regular stopping points with seating where you can rest and enjoy the views. Following the line of the railway used in the building of the dams, the Elan Valley Trail is suitable for walkers, cyclists, horse riders and the less-able. Although the reservoirs are too deep and steep-sided to attract much wildlife, the surrounding oak woodlands have an abundance of wildlife, plantlife and birdlife. Ravens, buzzards, peregrines and red kites can all be seen overhead, while great crested grebe and goosander breed on the water. The start of the Trail is located just out of Cwmdauddwr, west of Rhayader along the B4518. Opposite the start is a small car park (grid reference SN 966677). The start is marked by a sculptural gateway by artist Reece Ingram. About ½ km along the Trail you reach the Radnorshire Wildlife Trust Reserve of Rhayader Tunnel. Continue towards the Elan Estate for another 3.5 km where you reach a left turn at a road T- junction. From here you follow the road down the hill for 1/2km to the Elan Valley Visitor Centre, or cross the road and continue along the next section of the Trail. The Trail continues for a further 9km up the Elan Valley to Craig Goch Dam. At 1km intervals you will see sculptural benches, created by artist Dominic Clare, the first of which is located just past Caban Coch Dam. Continue alongside the waters of Caban Coch Reservoir to Garreg Ddu. From here you may wish to cross the viaduct for a closer look at Nantgwyllt Church. Otherwise continue across the road past the Foel Tower. The Foel Tower is the point at which water is extracted from the reservoirs before starting its 118 km journey to Birmingham by gravity. Continue along Garreg Ddu Reservoir for 3km then cross the road and continue up the gradual incline up through the trees to the top of Pen y Garreg Dam. The track now levels out and passes alongside Pen y Garreg Reservoir. About 1km along from Pen y Garreg Dam, you will pass through Devil's Gulch. The Elan Valley Trail is a linear path following the line of the old Birmingham Corporation Railway. The trail starts in Cwmdauddwr, just west of Rhayader and finishes 13 km (8 miles) further up the Elan Valley at Craig Goch Dam. The final stretch of the Trail takes you to Craig Goch Dam, this is the end of the Elan Valley Trail and was the terminus of the railway. 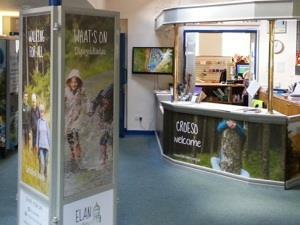 The Elan Valley Trail is open throughout the year.